Although my first post on this blog is from November 2005, I really count my blogging anniversary as January 7. Why, you may ask? Because January 7, 2006 is the day I realized that someone had left a comment on one of my posts. For the first time I understood that people were coming to visit, but for the life of me I couldn’t figure out why anyone would be interested in my ramblings about recipes! Didn’t they know that I was just a rank amateur who enjoyed playing in the kitchen and that this wasn’t supposed to be a blog, it was just an online database for my recipes? I wasn’t writing this for anyone other than myself, though I hoped it might be useful to the boys when they grew up and left home. Now I’m having a fabulous time playing with food, photographing the successes and failures, and sharing both with all the great people who visit. I’ve made some wonderful blogging friends and found some awesome cooking blogs! Every day I’m just amazed at and inspired by the talent in the cooking blogosphere and I keep hoping that some of it will rub off on me. Thanks to all of the readers and other bloggers for making the last two years really fun! So today is a celebration day! (I forgot to do this last year, but the baby was only a few months old, I wasn’t getting any sleep, we were preparing to sell our house and move, and Michael was engrossed in preparing for his new job. Our life was busy with other things.) For the celebration I decided to tackle one of the old Daring Baker challenges. I joined The Daring Bakers in July, so I have eight challenges to make up (not a requirement for membership, just something fun I wanted to do), and I plan to do them all but not in any particular order. Since my family loves soft pretzels, I decided that should be the first make-up challenge, an appropriate choice since the pretzels were the very first Daring Baker challenge. I plan to do another make-up challenge this coming weekend–a birthday cake since birthday #42 comes on Thursday–but it’s a secret. Not my age, the cake. Will it be the flourless chocolate cake, the red velvet cake, the chocolate crepe cake, or the Gateau Saint Honore? You’ll have to come back next Monday to find out! 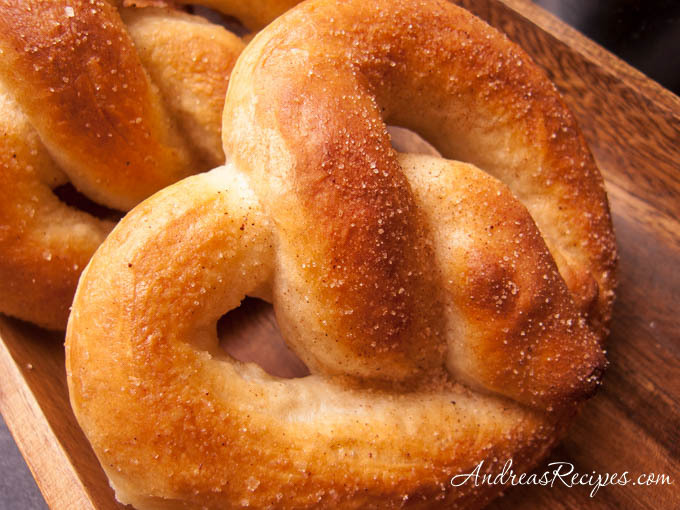 The pretzel recipe is pretty straight-forward, and made for a fun weekend afternoon project. The boys and I had a good time rolling them together. 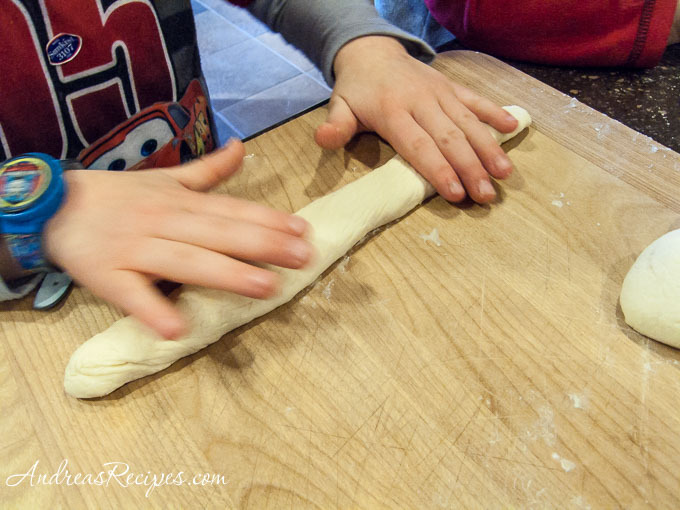 I gave small bits of dough to the boys because they struggled with a full-size piece. My five-year-old caught on after a few minutes, but my three-year-old had dough stuck all over his hands which upset him. “Mommy, the dough is too sticky!” We just kept cleaning his hands and flouring his hands and work space. He played with it more than anything else. Still, they enjoyed themselves and made alphabet shaped pretzels. I stuck with the traditional shape and followed the recipe exactly with the first batch, using only butter and kosher salt for the toppings. For the last two batches I played around with seasonings, sprinkling cinnamon and sugar on top of one, and mixing garlic powder, onion powder, basil, and oregano into the dough of the other then sprinkling the top with a little more garlic powder and grated Parmesan cheese. The pretzels were very flavorful, slightly crispy on the outside and chewy on the inside. They puffed a lot in the oven and turned out a little chubby, but we like them that way. Mustard and other condiments go nicely with the salted pretzels, as well as a good German beer. The recipe says to bake the pretzels on a baking sheet lined with parchment paper, which in my oven just turns crackly and burns at 500° F. After burning two sheets to a crisp I switched to a silicone baking mat, which worked beautifully. 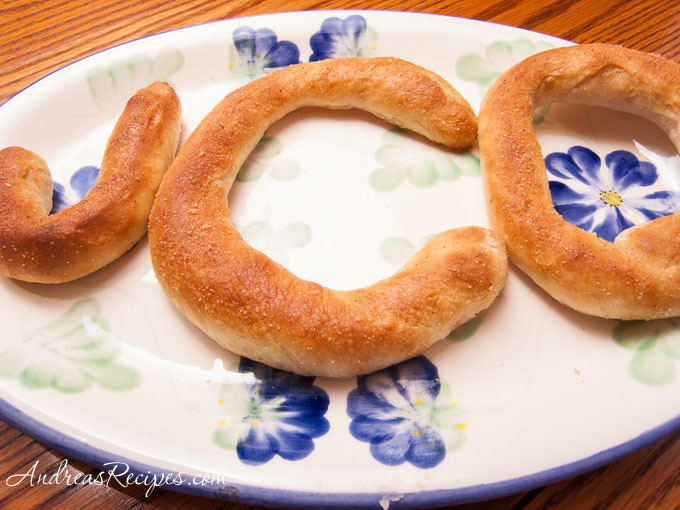 We loved these pretzels! My boys could hardly stand waiting for them to cool before diving in, and after tasting the Parmesan cheese pretzels, Michael said, “That’s good. 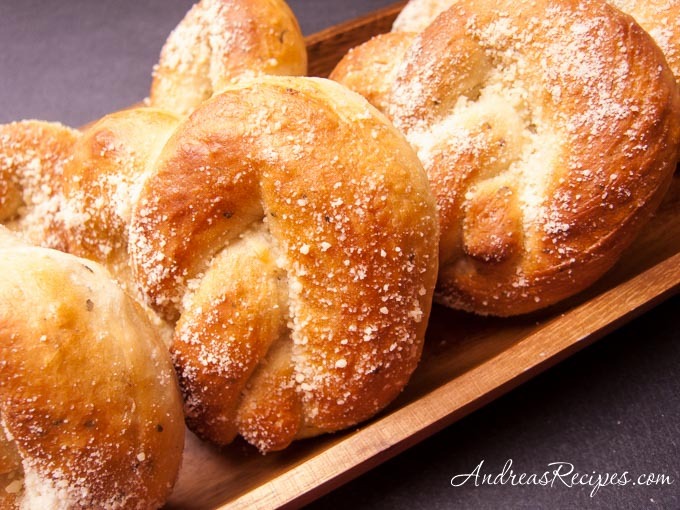 (pause while chewing) That’s very good.” I will definitely make these again and continue playing around with seasonings, but I’ve got another pretzel recipe on my mind that I want to try first. It comes from a cookbook that I am reviewing and I plan to post on it sometime this month. Adapted from The King Arthur Flour Baker's Companion. In the bowl of the stand mixer, whisk together the flour, yeast, sugar, and salt. (Add the seasonings if you wish.) Add the warm water and stir well with your hands or a wooden spoon. Work it until the dough comes together into a ball. It may look shaggy, but that's fine. Just make sure all of the flour is in the dough. If not, you can add a few drops of water and keep working the dough. Attach the dough hook to the stand mixer and turn the mixer on low, mixing for 5 or 6 minutes, until the dough clings to the hook and pulls away from the sides of the bowl. It should look very smooth. (You may also knead the dough by hand for 8 to 10 minutes). Sprinkle some flour on the dough and put it into the prepared rising bowl. Cover loosely with plastic wrap and let the dough rest in a warm spot for 30 minutes to an hour. The dough will double or more. In the small wide bowl, dissolve the sugar in the warm water and set aside. Divide your risen dough into 8 equal pieces. Roll each piece out into a long rope that’s about 24 inches long. Mine were slightly shorter due to the constraints of work space, which is why our pretzels were a little chubby. Taking hold of the ends of the rope, cross the rope over itself to form a circle with about 4 to 5 inches on each end that are sticking out. Twist the ends over themselves and pinch each end into the pretzel. Carefully dip the pretzel in the water and then place on the prepared baking sheet. Repeat with the other pieces of dough. Sprinkle the pretzels with the kosher salt (if you don't plan to use cinnamon and sugar or garlic and Parmesan for toppings) and let them rest for about 15 minutes. Put the pretzels in the preheated oven for 6 minutes, then rotate the trays and bake for an additional 6 minutes. Keep an eye on the pretzels so that they don’t burn. Remove the pretzels from the oven and immediately brush them with the melted butter. Use all of the butter. After brushing the melted butter, sprinkle the cinnamon and sugar or a little garlic powder and some Parmesan cheese. Happy blogversary! I wish you all the best for the blog and for all your food-related projects! Your pretzels look rather delicious – and you had great fun with the kids, which is just perfect. Thank you!!!! You are amazing too! 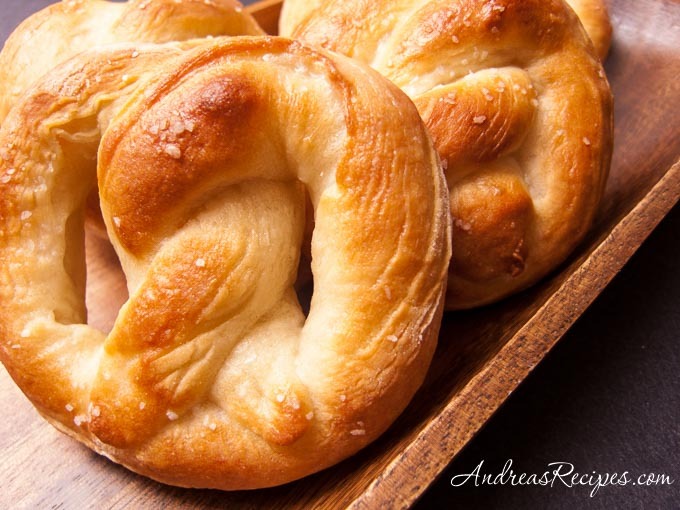 Happy Anniversary, Andrea – I have enjoyed reading about your kitchen adventures, and the addition of herbs to the pretzel dough sounds oh, so tasty! Way to go back and do the pretzel challenge…it’s the only one I never did…I should probably do it! Happy two years of blogging! I think that’s kind of like dog years, each year of blogging = about five years of regular life! Happy two years! Great idea to do the makeup challenges. I’ve never made pretzels but now I want to! Hi Andrea! Happy blog anniversary! Muchas gracias por tantas recetas lindas e tantas otras que no quedan aún por vivir (Did I get this right?) And I am so glad we met through blogging! Aw, thanks to all of you for the sweet comments! I really have had so much fun blogging, and I’m looking forward to going to BlogHer this summer! Congratulations for your beautiful blog!!! Your recipes, explanations and photos are great, and I have a link of your blog in my blog. Congratulations! Your blog looks great and is very interesting! Keep up with the great work! Super easy and Delicious recipe!!! This is the only DB challenge that I missed, but I still have plans to make it up eventually! Your pretzels are certainly encouraging, they look great! Well done ! i really must work harder and do more bakes…Time is so short..
What a great idea! Daring bakers! I love it! I tried pretzels a few months back they didn’t turn out as awesome as yours looks I will admit that! But they were still good. 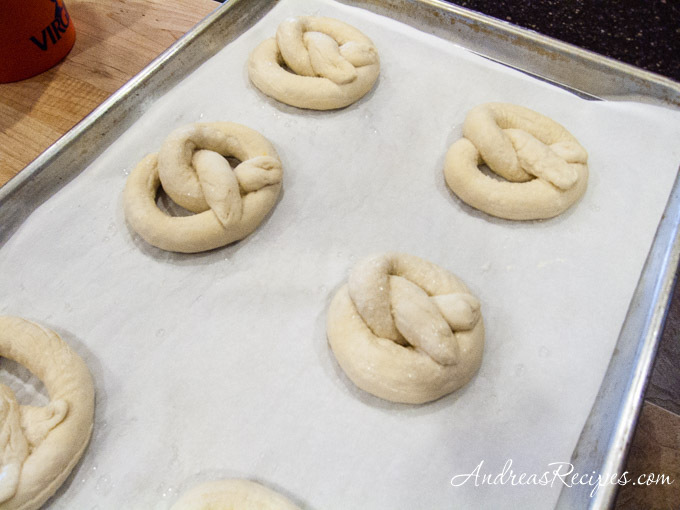 I have the photo of the pretzel twisted on my baking sheet posted on my Aunt B’s Cookin’ section of my blog. They were tasty enough to disappear before I was able to take the finished product picture. Thanks for sharing! I will have to check out the Daring Bakers!